WORCESTER ZWARTBLES TO 2,700 GNS. The Midlands Zwartbles Group Annual Show & Sale recorded a staggering top price of 2,700gns for a ewe lamb from Rob and Vicky Grinnall’s “Beech Hay” flock. 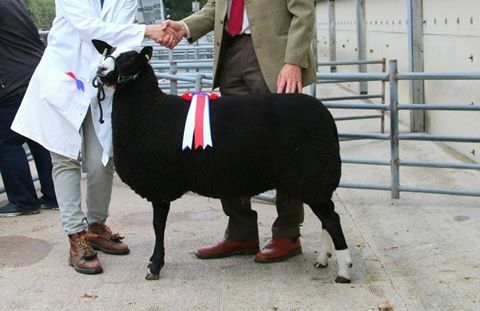 The lamb “Beech Hay Dbl Diamond” had previously won Reserve Breed Champion at Royal Welsh and Burwarton, 1st Royal Three Counties and won Overall Champion at the pre-sale Show. She was secured, after some very spirited bidding by GP Addison, Barnard Castle, Co. Durham. Other Ewe Lambs sold to 350gns for Beech Hay’s other entry which went to Mrs Stephen Renfree from Cornwall & 260gns for the second prize lamb from AJ Thorburn “Holmlea” flock taken by K Barwell, Daventry, Northants. Shearling Ewes were closely followed and peaked at 300gns for a second prize winner from Porter & Evans “Brace” flock going to J. Thorburn, Dumfries. A small consignment of rams topped at a creditable 350gns for “Holmlea Cheton” a shearling ram having won Reserve Male Champion from AJ Thorburn and secured by A Finch, Coalville, Leicestershire.